In the year 1977 in Yonaki Village, Kazunari Honda and Natsuko Honda—his cousin and girlfriend—live a peaceful life despite most of the other villagers not approving of their relationship. But soon, they will have more to worry about than the opinions of the townsfolk, as a mysterious black envelope appears and informs the villagers that they will be participating in the "King's Game." The rules state that the commands must be followed by the end of the day, and that no one is allowed to quit. With most viewing the appearance of the envelope as a joke, they soon realize that those who don't obey the orders will die. As more villagers meet their demise, Kazunari and his friends realize they must play the terrible King's Game, all the while suspecting that someone in the village may be the King. Ousama Game: Kigen was published digitally in English as King's Game: Origin by Crunchyroll from January 24, 2014 to January 25, 2016. Before writing a review for this manga, I decided to backtrack and read the original "Ousama Game" story. Here's the thing, "Ousama Game" and "Ousama Game: Kigen" are essentially the same story just with different settings. Now to be fair, "Ousama Game: Kigen" is a far better told version of "Ousama Game". I didn't care much for the original at all, but I was legitimately interested in the story of this one. All the problems with the original were fixed in this story. The cast is smaller and have better character development with their progression towards going insane and murdering each other done much better. Overall, the characters behave more like human beings than they did in the original. The story is set in a remote village rather than a city, which makes the characters feel more isolated and helpless. The Ousama's orders build on each other very well, getting gradually harder to perform and having progressively more gruesome punishments. This story also has the police get involved with the events of the Ousama Game. I liked this because it made the story feel more realistic and, honestly, the detective was one of my favorite characters. There are still a few problems with this story. While the character development and story flow are far superior to the original, there are still places where they could be done better. The reason for the Ousama Game and "big reveal" at the end are pretty lame. The reasoning behind everything is awfully far-fetched, and unlike some horror stories like Higurashi, there isn't enough background information or hints for a proper build up and reveal. This also makes it impossible for the audience to guess what's going on ahead of time, which can weaken the impact of the twist. In fact, the ending of this story makes the original story make even less sense. This works much better as a stand alone story than as a prequel to "Ousama Game". Never the less, this one is worth a shot it you have some spare time on your hands. There are points that could have been better, but for the most part it was a decent enough read even if the end was a little disappointing. It´s not very common that prequels exceeds its original, but this is exactly what happened with Ousama Game. OG: Kigen serves as a prequel and offeres a very unique insight to the times, where the "King" was forced to use letters instead of phone messages and how would a whole village react to the common enemy. According to me, the story was very good and decent. Art was also very pleasurable. This manga contains totally different characters and I dare to say, better characters than Ousama Game. The explanation is given according to the whole "virus" thing and about creation of the "King" and "Kings´s Game" (aka Ousama Game). I enjoyed this manga very much and definitely will reread it sometimes. For me solid 8/10 and I hope that other mangas in OG series will be just as good as this one. Woah, it's like the author suddenly gained some IQ points. Really, this is so much better than the original Ousama Game. The plot is basically the same as the original Ousama Game, but replace the modern students with villagers from an isolated village in the year 1977. But here, the execution is so much better. A lot of things aren't happening at once, unlike the original manga. It also explains some stuff you might not have understood. BUT, despite all that, it isn't perfect, sadly. It feels quite unfinished and at some points, rushed (Especially at the ending). Some more explanation could've helped, too. The Art is REALLY good, sometimes i just looked at some panels for an unexpected long time. Definitely an upgrade and it was a good decision to actually switch mangakas. But i noticed some panels who were a bit off or awkward because of the art style. The MC was your typical wimpy hero with a good sense of justice, there wasn't too much Character Development on him. But it was the Supporting Cast who stole the show for me, it was really interesting how the villagers' reacted to the King's Game and how their Characters changed over time. Especially mah gurl Michiko. Read this if you've already read the Original Ousama Game and have been dodging everything related to it like the plague. But trust me, this one won't disappoint, at least as much as the original. And if you haven't read the original, this is definitely a good read. The only connection it really has to the original is at the ending. I enjoyed it. 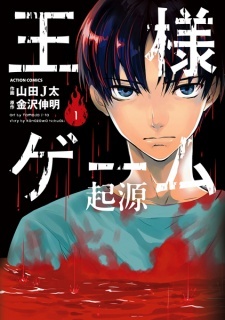 Ousama Game: Kigen or King's Game: Origins is way better than Ousama Game(the one set in the school setting) so if you read that one and just because you didn't like it. Please read this one. I gave this manga a 9/10 because in my opinion this manga is so good. The art is so beautiful. The first thing I look at before reading a manga is the art so if you're like me you will enjoy this one. I don't want to spoil you but the ending is not that good BUT the overall story is better than the Ousama Game(high school setting). The characters in this one are more human like. They will do anything to survive and when I say anything I mean ANYTHING. Compared to Ousama Game(high school setting) Kings Game Origins is a real battle royale. Villager against villager the characters will do anything to survive (they will kill, deceive, whore their way to victory, and pretty much sell their soul to the devil just to survive). Does this manga ever get animated?